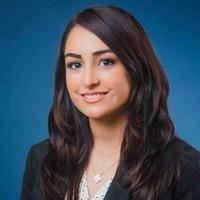 Yasmin Bigdeli is a third-year law student at UC Hastings College of the Law where she has served as Co-President of the Iranian Law Students Association, Vice President of the Hastings Public Interest Law Foundation, and Operations Editor of the Hastings International and Comparative Law Review. Yasmin was nominated for the Outstanding Contribution to UC Hastings and Student Leader of the Year awards in 2018. Along with her activities at UC Hastings, Yasmin has gained advocacy and litigation experience by clerking both for a plaintiff-side civil litigation firm, as well as several District Attorney’s Offices in the bay area, where she continues to advocate on behalf of victims of domestic violence and sexual assault. Yasmin received her Bachelor’s degree in International Relations from the University of San Francisco, and believes that the Iranian community must raise awareness and unite in order to conquer the obstacles facing Iranians in the United States and around the world.